I don’t know what is more appealing- the puppy or the tortilla. Fantastic post and great recipe. Mainyacha – Couldn’t agree more about the puppy comment! 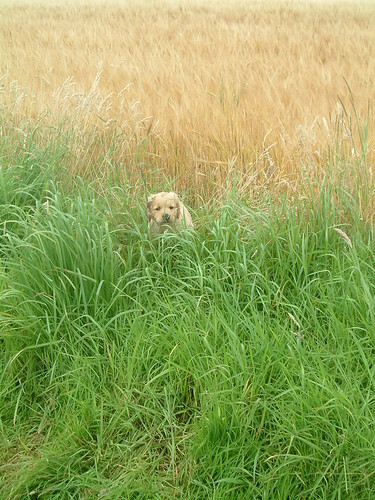 Truffle – Puppy wins every time for me! Hello Wendy. No need to add a word with such a cute puppy, not that your writing is bad but…well you know what I meant. Spanish tortillas are my favorite for dinner. It’s funny because yesterday I made roasted red peppers and green peppers tortilla with olives and tomato. So delicious! My hubby prefers the potato, like the one you made. We Italians call this a frittata. I love them. They make a nice sandwich too 🙂 Yours looks lovely..and the pup is so cute! Wendy – Isn’t it amazing the so few ingredients cooked together can result something so sublimely comforting. I love the depth of Spanish tortillas – in both size and flavour. I’m glad you suggested it as a picnic treat…I’ve been wondering what to take for my next one (got to make the most of the Californian Summer before heading back to a wet New Zealand springtime). Rose – I’ve made it with raw peppers before but never roasted. LOVE the idea! Love roasted peppers! 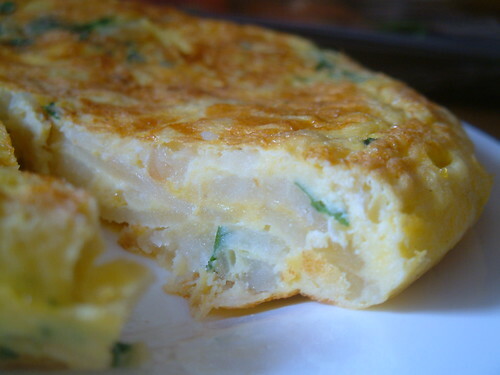 Maryann – I was just wondering what the difference between a tortilla and frittata was (my family would laugh to hear me say that!). Thought the difference was that frittatas were cooked slower and the put under the grill. Perhaps I was looking into it too much and they are, as you say, the same thing in two differenct languages. Shaun – Highly recommended for a picnic! So, two summers for you this year? Lucky guy. We didn’t even get one here in Scotland! Very lazy but who cares, as you say, delicious!!! Sorry for double tagging you with the Fantastic 4. I had a lot of good words to say about your neck of the woods in mine. Good food. Good photo. ‘nuf said. They both start with ‘T’ – what more do you need? I love them cold – in Spain you get them in sadwiches! That would be ‘sandwiches’ …got to learn to type! David – I read all the lovely things you had to say about Scotland and smiled lots. Katiez – “Sadwiches” sounds kinda cute! Tortilla sandwiches? It’s like a Spanish chip butty! Now Wendy, I do believe it is time to bring a puppy into your home! You love those little guys (or gals) so much. This photo is adorable! Such a beautiful puppy picture! Teal is adorable, I have a lab and they are the greatest dogs ever! I have just written about tortillas on my blog and it looks like I have copied your idea, but I never, honest!, we were having them to eat last night for the bb eviction!! Wendy, that photo of Teal is so cute! I’m glad you posted it. And your tortillas looks delicious. yummm! Pia – He really is a cutie! Nora – Couldn’t keep it to myself! The recipe looks great. The puppy picture is adorable. Thanks for keeping us all smiling (and hungry). Best Dog Videos – Thank you! 🙂 Will have to check out your site soon.